An animated cartoon is a short, hand-worked (or made with computers to look like something hand worked) movie for the cinema, television or computer screen. It tells some kind of story, even if it is a very short one. An 1893 phenakistoscope disc by Eadweard Muybridge. The advent of film technology opened opportunities to develop the art of animation. The basic animation process is described in the article Animation, and the classic, hand-drawn technology in Traditional animation. At first, animated cartoons were black-and-white and silent. Felix the cat is a notable example. 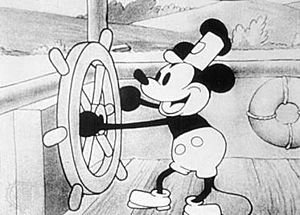 The first cartoon with synchronized sound is often identified as Walt Disney's Steamboat Willie, starring Mickey Mouse in 1928, but Max Fleischer's 1926 My Old Kentucky Home is less popularly but more correctly credited with this innovation. Fleischer also patented rotoscoping, whereby animation could be traced from a live action film. With the advent of sound film, musical themes were often used. Animated characters usually performed the action in "loops", i.e., drawings were repeated over and over, synchronized with the music. The music used is often original, but musical quotation is often employed. Disney also produced the first full-color cartoon in Technicolor, "Flowers and Trees", in 1931, although other producers had earlier made films using inferior, 2-color processes instead of the 3-color process offered by Technicolor. Later, other movie technologies were adapted for use in animation, such as multiplane cameras, stereophonic sound in Disney's Fantasia in 1941, and later, widescreen processes (e.g. CinemaScope), and even 3D. Today, animation is commonly produced with computers, giving the animator new tools not available in hand-drawn traditional animation. 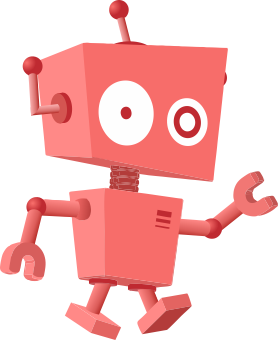 See Computer animation for further information of the specific technologies. However, many types of animation cannot be called "cartoons", which implies something that resembles drawings. Most forms of 3D computer animation, as well as clay animation and other forms of stop motion filming, are not cartoons in the strict sense of the word. An animated cartoon created using Adobe Flash is sometimes called a webtoon. Animated cartoon Facts for Kids. Kiddle Encyclopedia.